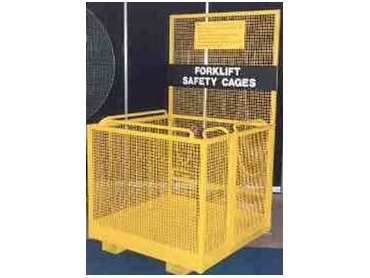 Forklift Safety Cage, available from No Bolt , has a safe work load capacity to hold 250kgs (two people plus equipment). Forklift Safety Cage is an ideal tool to access racking in your warehouse. Forklift Safety Cage is suitable for packing, stocktaking, maintaining or organising the racks in your warehouse or distribution centre. Safety harness and lanyard are also available.